* Treasure Chest - Left over cake filled with m'ms. Biggest tips would be to work off frozen pre-made cakes and use butter icing. I started by making 3 square cakes which were then frozen. The next step was to plan what size and shape each piece should be and how I was going to cut them out of each piece. For stability try to have the joins vertical and that the horizontal layers are in one piece where possible. You need to have quite flat cakes, so I found it best to trim them down again whilst they are frozen (but have been out for about 5mins first). You will need to work quick as the cakes will defrost quite quickly. This is why the planning is so important. I cut the pieces and checked that they all went together as planned and then put them back in the freezer to set again. The cake needed to be able to be transported about 25kms in the car, which was a bit of a concern but crossed my fingers and hoped for the best. For transporting purposes I took a 15L container and tipped it upside down. To aid with stability I laid a layer of butter icing down on the lid first then taking the bottom layer of the cake lay it onto the icing. Take the Rudder (tim tams) and again ice them to the lid behind the bottom layer of the boat. From the second bottom layer I cut a slot out of the side for the plank (kit kat) this will need to run across the majority of the boat for stability. Ice in the plank and the second bottom layer making sure to pad around the rudder (tim tams) if necessary. Continue adding the upper layers icing between each layer as you go. Cut out a hole for the bowsprit (twix) and insert at an angle far enough to stay in place. Ice the boat (chocolate) and pipe icing around the bottom (blue to mimic water). Take the chocolate buttons and insert them vertically around the top of the deck to look like a railing of sorts. Add some to the side of the boat to look like portholes or canons. Add some canon balls (maltesers) to the deck. Add the sails (skewers) and any other accessories as desired. You always surprised me with your blogs are impressive. Why don’t you write often? I hate it to wait for a week you should write on daily basis. 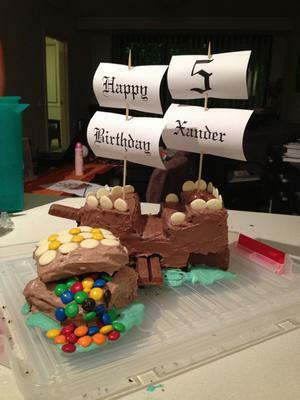 Yes, It's really Creative design of Pirate Ship Cake and that design i have never seen before come this website. Infect, this website all about the cakes with very amazing designs. I hope the taste of such cakes also good like the designs of cakes. any how, I try to find custom essay writing but this is best site which have good collection of cakes. Well! I got a lot of useful articles which have valueable information to express and explore the whole topics. This post show your work hard which you did for this site. I hope other people feel same like me. Actually, I want to find college essay services but after getting this site like to read each article of this site. Return to November, 2012 Cake Decorating Contest Submission Form.